"Let these good pious Palat'nates, And all such strange we know-not-whats, In their wise interloping Freak, Go to the Devil's Arse a-Peak." From the English poem, "Canary-Birds Naturaliz'd in Utopia," published in 1709. A "Johan Kristhaus" was listed in the 6th party arriving at Rotterdam in 1709 with his wife and six children, but then there was another delay in the journey. So the family lived for many weeks in what can best be described as a shanty townalthough that might be glamorizing it too much. It was really just a bunch of primitive shacks covered with reeds. The Palatines were questing after "milk and honey"but now they were having trouble even finding water and bread! Finally, the Mayor of Rotterdam took pity on them and donated some food and supplies. Still, as bad as the conditions were at Rotterdam, the journey to London was even worse. It was supposed to have been a voyage of under four weeks, but they didn't actually arrive in London until months later. Furthermore, if they thought the British would be prepared any better than their hosts at Rotterdam, they were in for another in what would become a long line of disappointments. "What freak brought these poor creatures hither is not easy to guess ... Upon whose motive they were encouraged to come hither and what they are to do now they are here, is out of my reach." Roger Kenyon, after visiting the Palatines at the Blackheath Camp, August 1709. A contemporary woodcut of the Palatines attending church in London. By October of 1709, over 13,500 refugees were in London. Most were camped in tents on the Surrey side of the Thames River at Blackheath, outside the city wall of London. Others were at camps in Deptford and Camberwell. 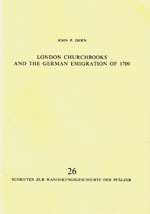 Among the throngs of destitute immigrants was now Pastor Kocherthal, himself, who had sailed back to London to plead for additional help for the 53 Palatines he had led to the district of Newburgh (Neuburg), New York, named after a city in the Upper Palatinateas well as his promised commission of twenty pounds sterling and 500 acres of land. What Kocherthal found in London was that the British people, convinced they were going to lose food and jobs to these new arrivals, hadn't done much to welcome the "Poor Palatines"in fact they had rioted, and many attacked any German-speaking immigrants. Each day had grown worse, and many of the refugees were giving up, accepting offers to go to Ireland and work as share croppers. Others were returning to what was left of their homelands. But not Johann Christian Hauß. He had persevered. He could hardly picture life getting any worse... But it would. Finally, around Christmas time in 1709, some 845 families boarded eleven ships for the long trip across the Atlantic Ocean... Where they continued to wait for a go-ahead from the queen. So Christmas was spent on a smelly, overcrowded boat. Christmas wasn't celebrated much in England at that time, anyway. It was meant to be a day of penance and contemplation. The Germans, however, loved celebrating the holiday, and so there were probably some games and activities on the ship, despite their desperate situation. The children could have expected a visit from Pelznickel (Saint Nicholas in furs), better known as "Belsnickel." This version of Santa liked to scare children half to death, before changing character and giving them sweets. Of course, with no money, fruit or candy (let alone a barn), and with the anticipation of a long, dangerous trip across the Atlantic, the celebration was probably subdued... But the Hauß family didn't celebrate at all. "It is supposed that Christian Hauss' first wife ... died on the voyage over, or soon after reaching these shores, as history of that period tells us that sickness and privations took many lives, both on the voyage over and the winter following." SOURCE INFORMATION: Schriften Zur Wanderungsgeschichte Der Pfalzer; Copyright 1968 John P. Dern, 950 Palomar Drive, Redwood City, California, 94062. It was always assumed that Maria Catharine Hauß died on the long voyage to Colonial America, but there is now substantial evidence that she actually died in England, near or on Christmas day in 1709. (Merry Christmas, Hauß family.) 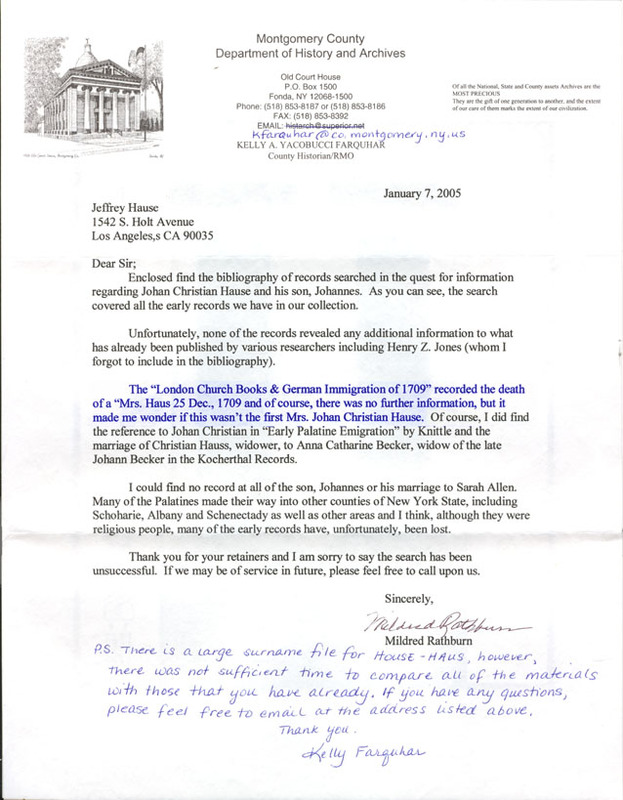 The London Savoy German Lutheran Church in the Strand, in neat German script, lists in its records the death of a "Mrs. Haus" on December 25th. The cause was never recorded, so whether it was from starvation, typhoid, or a pre-existing condition we'll never know. The remaining Hauß family waited to discover their fate from the British authorities, but an answer wasn't forthcoming. The Palatines remained onboard their docked ships for several more months before actually sailingjust waiting, starving and grieving. 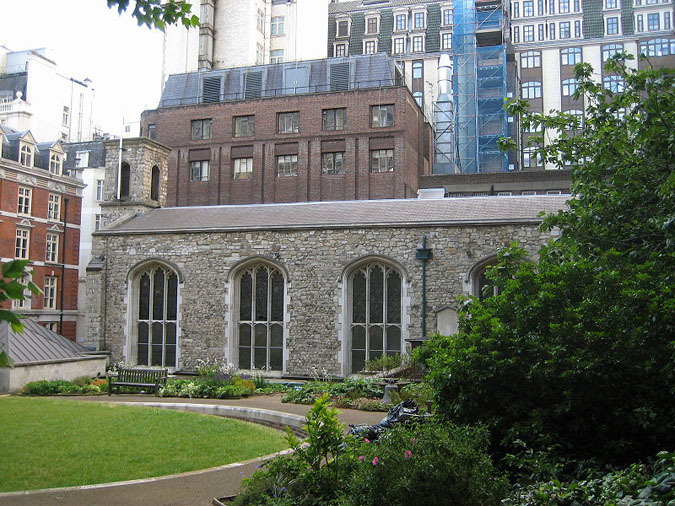 The Savoy Chapel, once part of the Savoy Hospital dedicated in 1512, as it looks today. The German Lutheran congregation of Westminster (now at 10 Sandwich Street, London, WC1H 9PL, crossing Thanet Street, near St Pancras) was granted royal permission to worship here in the 1690s, next to the hospital and prison. Pastor Irenaeus Crusius dedicated the chapel on the 19th Sunday after Trinity 1694 as the Marienkirche, or the German Church Of St. Mary-Le-Savoy. It was then called the Savoy German Lutheran Church off the Strand. This chapel seviced the Palatine immigrants, and recorded the death of "Mrs. Haus" on December 25, 1709 in its Churchbooks. The chapel is now in use by the Church of England as the church for the Duchy of Lancaster and Royal Victorian Order. "When they are buried all the attendants go singing after the corpse and when they come to the grave, the coffin is opened for all to see the body after it is laid in the ground they sing again for some time and then depart. They carry grown people upon a bier and children upon their heads." If Christian could take any solace in his wife's untimely death, it was that she didn't have to suffer through the trip. The transport ships the Hauß family sailed on were dubbed the "Wonder Fleet," but the real wonder was that any passenger could survive the journey. Ships built before 1800 were not built to hold peoplethey were mainly designed to carry freight. Much like the ships that delivered slaves from Africa, or, later, the "coolie ships" that brought cheap Chinese labor to the west coast of the United States, the vessel carrying the Hauß family was just a cargo ship, only slightly altered to fit humans. The steerage decks that they were confined to for the journey were four-to-five feet high, with two tiers of bunks around the perimeter. (Captains refused to put cattle in these steerage holds because the mortality rate was too high, but they were deemed fit enough for the Palatines.) There were no portholes, nor any other means to bring in any light or fresh air. The only lights in the compartment were a few hanging lamps which could be lit at night, but they couldn't be used during storms. During those storms, which could last up to a week, emigrants were denied access to the main deck, and the hatches were battened down tightly, leaving no source of ventilation... although they weren't tightened down before a few waves had poured in and soaked all the bedding and clothing. It was dark, damp, the toilets were just buckets that constantly tipped over on the waves, and taking care of personal hygiene was next to impossible. Disease spread in the urine, blood, spit and mildew on the floor and walls, and lingered in the holds. Rats scurried across the floor. For meals, they were fed on the same ration program as convicts on prison hulks: Salted corned meat, peas, barley, groats, and codfish. Their drink was the stinking water in which all the food was cooked. A passenger list from the voyage. About 3,100 emigrants sailed on eleven ships to New York, and were accompanied by the Governor-Elect Hunter. British records listed a Johann Haus and three children embarking on the voyage. (His son, Rheinhardt, is also specifically listed. 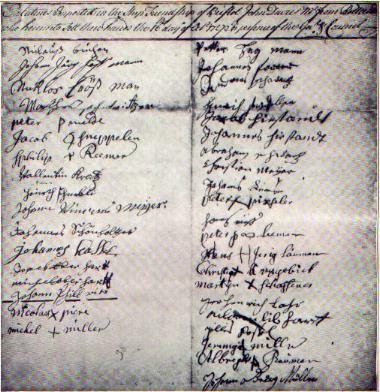 There is also a Johan Adam Haus (or Haas), by himself, on the immigration lists, and a Glein Haus, "with wife," but their relationship to Johann Christian Hauß is unknown.) 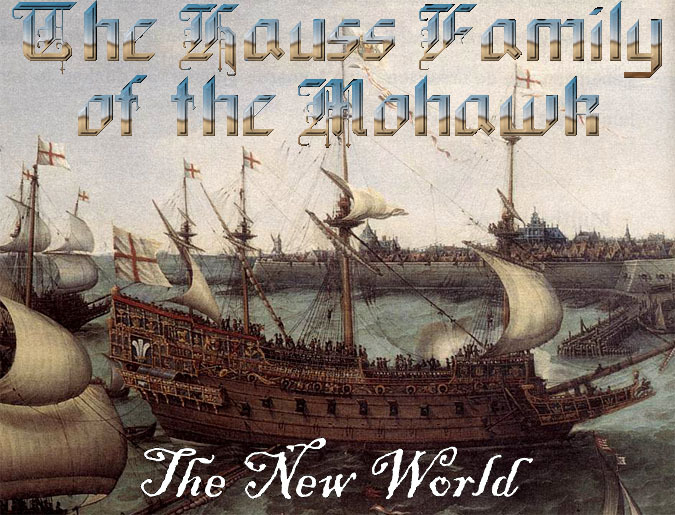 Going by reconstructed passenger lists,Ò The Hauß family was probably on the eighth ship. For months, they were packed inside the hold alongside several hundred other passengers, with no fresh air or daylight and unable to standtheir days filled with only darkness, foul odor, vermin and tiny rations of rotten food. Of the 3,100 who left England almost 500 would die, many of "ship's fever" (now known as typhus). If that wasn't bad enough, one ship was even wrecked along the New York coast just as the worst part of the journey seemed over. Johann Christian Hauß's ship, if the eighth, would have arrived in New York right around the fourth of July, when he made his first appearance on the "Hunter Subsistence Lists." This means that on the day we now celebrate our independence in this country, Johann Christian Hauß was declared a veritable slave. Seeing the wretched state of the starving, sickly, disease-infested passengers onboard the ships (not to mention 500 rotting bodies awaiting burial), the New York City Council quarantined all of them offshore on Nutten (now Governor's) Island for almost four months without food and supplies. Obviously, this did nothing to improve their health, and 250 more perished from the fever, which was to be known for many years in New York City as "Palatine Fever." "23. Sept. 27th: Christian HAUSS, widower, a carpenter, of Alten-Staeden, near Wetzler, duchy of Solm and Anna Catharina BECKER, widow of the late Johann BECKER, of Duernberg, near Dietz, commune Schaumburg." 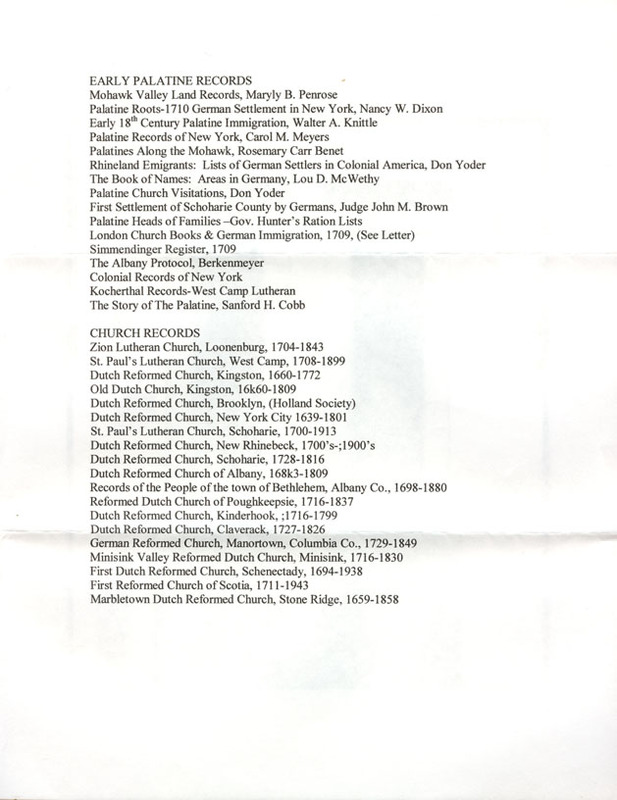 page 41 of Reverend Joshua Kocherthal's church record. Still, there was some good news for Christian: On October 27th, 1710, Rev. Joshua Kocherthal united him with ANNA CATHERINE BECKER, a widow whom had arrived on and earlier boat (probably Anna Catharina Ller, b. 1670 in Dürnberg, Cham, Bayern, Germany. The Beckers and Llers crossed together, and the families intermarried), in holy wedlock at the West Camp Lutheran Church. On the Colonial frontier, the loss of a spouse required quick remarriage, as men and women had too many differing responsibilities (the men outside of the house, the women inside of the house) to be able to raise children alone. Marriage was a business contract, and had only been "sanctified" by the church for about 150 years. "Mourning" was a luxury that was unavailable to Europeans and Colonists until the Victorian era. Speedy remarriage was the rule, often within months of a spouse's death, regardless of gender. Anna was in the same situation as Johann Christian Hauß. She was the widow of Johann Becker, who had also died during the journey to America. She was from an area of the Holy Roman Empire on the Lahn river. The Grafschaft (County) Dietz (or Diez) became part of Nassau-Dietz, which was elevated to the rank of Fürstenland under the name of Nassau-Oranien in 1388; and since 1747 the ruling family in Nassau-Dietz has reigned in the Netherlands. So back in Europe, the residents of Johann's and Anna's villages might have been at war with each other on several occassionsbut in the New World, circumstances helped to bring these "Palatines" of differing homelands, religions and even languages together. The honeymoon accommodations were primitive at best, but since Johann was a carpenter, I'm sure the threshold he carried her over was a sturdy one. Governor John Hunter, happy as ever. Two days later, the newly elected Governor of New York Colony, Sir John Hunter (at right), purchased six thousand acres of land on the west side of the Hudson, near the Mohawk River, for the Palatines to settle. Unfortunately he bought the land from land baron Robert Livingston, a former colleague of Captain Kidd the pirate. And it wasn't so much "land" that he sold to Hunter, as it was a pile of rocks. So the newly-expanded Hauß family faced another hard journey, this time on roads that were little more than footpaths cut through a forest of dense pine forest, to get to the barren wasteland where they were to live. They pulled small hand carts and wagons, and carried all of the food and supplies they could scrounge up on their backs (minus weapons and tools, which the British confiscated, to keep them from running off or revolting). By October, these poor, weary immigrants were clearing the land and building small huts for shelter. But it was hard to build houses without proper tools: Some lived in caves that were dug into hillsides, with brush covering the entrance. Others lived in mud huts or cabins made out of very rough logs. Of course, being an experienced carpenter from war-torn Solms, Johann Christian Hauß and his sons were used to making due in such desperate conditions, and probably built a strong cabin for themselves out of wood and stone, held together by clay and/or mud mixed with chopped straw. (And if the land offered to the Palatines had anything in abundance, it was rocks.) Then they probably helped the other settlers create shelter from the fast-approaching winter. Most homes had only one room, which had a central stove or fireplace for cooking and keeping warm. A wooden bench was placed nearby so the family could sit and keep warm during the intense winter months, and that fire was kept burning all the time. "(The men would) dig a square pit in the ground, cellar fashion, six or seven feet deep, as long and broad as they think proper. ; case the earth all round the wall with timber, which they line with the bark of trees or something else to prevent the caving-in of the earth; floor this cellar with plank, and wainscot it overhead for a ceiling; raise a roof of spars clear up, and cover the spars with bark or green sods so that they can live dry and warm in these houses with their entire families for two, three or four years, it being understood that partitions are run through these cellars, which are adapted to the size of the family." Cornelis Van Tienhoven, secretary of New Netherland, describing the "dug-outs" in which the Palatines lived, in an official report sent to the Hague. By this point, Johann Christian Hauß must have wondered if he wouldn't have been better off in the Palatinate. They were surrounded by hostile Indiansand the dreaded French, who had burned their original homeland. The winter was just as cold and unforgiving as it had been in the Palatinate, except now Christian Hauß and his family were living in a hastily-prepared shackdestitute, defenseless and facing the unknown. The settlers at West Camp were pretty much left to themselves and allowed to build homes and to develop their farms. However, in East Camp the plan was for Johann Christian Hauß and the other settlers to make tar. Governor Hunter was under orders from Queen Anne was to build a Naval Stores facility. The British Navy was in dire need of pitch and tar for its fleet. The forest wilderness of pine trees in New York contained enough raw materials to supply the British Navy for many years. So he and the other redemptioners were put to work girdling pine trees for turpentine, in exchange for rations of food and drink. Unfortunately, the land picked for the project"barren rocks" purchased by Hunter from Livingston, was completely unfit for the task. 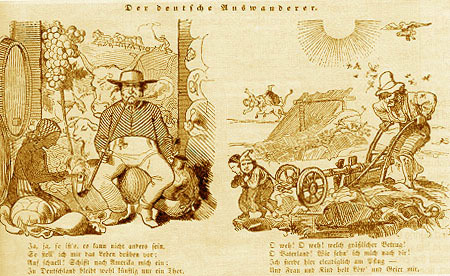 Dream vs. reality in "The German Emigrant," from the magazine Fliegenda Blätter (1845). At first, the Germans had been seen as just a human buffer between settled Colonial land and the Godless, warring Indian tribes. But after several Mohawk Chieftains visited and charmed the Queen in England, Fort Hunter was seen as the channel to saving the Indian soul. "The Society for the Propagation of the Gospel in Foreign Parts" had ordered the construction of a chapel and a mission house in the fort. Queen Anne herself donated a set of communion silver to the Mission. There they could "convert" the Native Americans (in essence: Conquer, sublimate, take their lands, and take anything valuable). Christian and his family were pawns in that effort, just as exploited as the Indians, but with even fewer rights (at least the Indians were allowed to leave the Fort). PETER HAUSS, born in 1711. He married Barbara Krantz. ANNA MARGARETHA HAUSS, born in 1712. She married Peter Wagner. Finally, in late 1711, the Whig party lost control of the British Government to the Tories, so support for Gov. Hunter declined, and, incredibly... the situation grew even worse! The entire "Pich and Tarr" project was shelved. Without Hunter's continued "financial support," the Palatines were soon left to their own devises... of which they had none. They weren't allowed to own farming tools, guns, or anything that would've allowed them to fend for themselves. The Mohawk River at Stone Arabia, Johann Christian Hauß's eventual destination, as it looks today. "We came to America to establish our familiesto secure lands for our children on which they will be able to support themselves after we die." The Hauß family and about fifty other clans escaped from Fort Hunter in late 1712, without permits, heading west into the wilderness about thirty miles to the "Land of Scorie." If Christian wasn't going to be given his rightful 40 acreshis Freiheitenthen he was determined to take his 40 acres. While slogging through deep snow and dense forest in freezing temperatures, and running from the "law," it must have seemed to Johann Christian Hauß that life hadn't changed a bit for him since leaving Solms-Hohensolms. For two weeks the desperate escapees cleared a path west of Albany "with the utmost toyle and labour," through the wilderness of the Helderbergs, down Fox's Creek... to a small brook where they stopped for "a general purifying"cleansing themselves of all the grime and bugs they had accumulated on the journey (the brook is still known today as "Louse Kill" in honor of the event). They were given food and shelter by friendly Mohawk Indians, and bartered for their land (which, as usual in those times, involved liquor)...Who knows, maybe the Indians sympathized, because they had been screwed over by the British, too. Many influential figures among Indians and whites crossed over from one cultural sphere to another, speaking various European and Indian languages and intermarrying, and forming political alliances between the two rapidly merging worlds. In New England some Indians still lived in traditional wigwams, but they filled them with European-manufactured furniture and decorative items. Some members of the Oneida tribe of the Iroquois confederacy practiced Presbyterianism, although simultaneously retaining traditional beliefs and rituals. Some Indians adopted European dress but retained the loincloths and nose rings of their own cultures. But then the Palatines encountered more trouble. It turns out the Indians were making a good profit on the landbecause they had already sold it beforetwice! An early settler named Nicholas Bayard had purchased this land in 1695 "from Six Idle drunken People" (sic) of the Mohawks, a tract "of so large an extent that a Young man has enough to doe (sic) to run over it in a day's time, and that for the value of thirty beaver skins in Rum and other goods." While Indians had successfully adapted some European ways and artifacts, the widespread introduction of alcohol proved disastrous for their societies. Drinking fed the violence and social dislocation that came with European contact; it also increased susceptibility to European diseases, which took a heavy toll. Europeans like Bayard were aware of the ill effects liquor had on Indians and often promoted its distribution to increase those effects. After hearing the evidence, the British Government declared that the Indians no longer held clear title to the land, having sold it to Bayard, and then sold it againto of all people, Governor Hunter! If Hunter wasn't already angry that his redemptioners had bolted from his fort and left him 20,000 Pounds in debt from the failed "Pitch and Tarr" project, now they were squatting on his most profitable land! "Being arrived and almost settled, they received orders from the Governor not to goe upon the land, and he who did so should be declared a Rebel." Clear title or not, Johann Christian Hauß cleared the land for a farm on the land he was promised. Having been forced to leave behind what few tools he had, he made do with whatever he could make from the forest... and on several occasions he and the other pioneers forcibly ejected land agents, including Governor Hunter's sheriff, as later reported by John M. Brown: "But when the Sheriff began to meddle with the first man, a mob of women rose, of which Magdalene Zee was captain. He was knocked down and dragged through every mud pool In the street; then hung on a rail and carried four miles, thrown down on a bridge, where the captain took a stake out of the fence and struck him in the side, that she broke two of his ribs and lost one eye; then she p*ssed in his face, let him lie and went off." So the relations between the Palatine rebels and their former overseers deteriorated even further. Some had prices on their heads, and all the men avoided going into town for supplies, fearing arrest by the British. Palatines believed that property didn't belong so much to an individual as to families and clans. While individually held, property and liberty were defended by the community. This value system would be ingrained into the Haus family for centuries: Land was acquired, fought for, settled, and eventually divided among the children with each successive generationwhen there was no more land to divide, they moved west toward open country.² And with no legal land available, Christian's sons began to move on: His son Rheinhardt ("Rynier Hous") was Naturalized on January 10, 1715, and was listed as working as a yeoman in Phillipsburgh. Eventually he moved to Hackensack, near his Becker stepbrothers, and his own brother Johannes, in Haverstraw. We know little of where around Albany County the remaining Hauß family lived, except that Nancy Wagoner Dixon's book, Palatine Roots, places them in the Schoharie settlement of Fuchsendorf ("Fuchs Dorp," above, which evolved into "Fox Town"Anna Elisabetha was confirmed there in 1720). Meanwhile, the Palatines on the frontier adopted Indian ways in the form of clothing, canoes, and native foods. They grew Indian corn and hunted just as Native Americans did. They soon created and wore breechcloths and leggings and were quite proud of their ability to hunt and live off the land like Indians. Wherever Christian's farm was, it had to be self-sustaining, as carpentry work wasn't very lucrative, seeing as his clients had no money. Fortunately, the British had been wise in their choice of destination for the Palatines: Eastern North America is quite similar to the Rhineland, and therefore an ideal fit for the Germanic farmer: The soil and climate are similar, and the land almost identicalprime flat farmlands cover the Hudson river, just like the Rhine, with the same kinds of maples, oaks, beeches, and ashes in the low hills. So the Palatines didn't feel out of place, and knew how to create a farm. Everything on the Hauß farm had to be made or bartered. So, to create a self-sustaining enterprise, on top of the pastures and grazing land that Christian reserved for the livestock (providing meat, milk, dairy products, and leather), he built pens to raise chickens, geese and ducks for eggs, meat, and feathers (for bedding). Surplus fats from the animals were used to make candles and soap. Shad and herring were caught making their runs up Schoharie Creek to the river, then pickled or smoked for later use. Wild pigeons were shot by the hundreds and preserved by pickling and smoking, as well. To round out the diet, the Hauß family probably grew wheat, corn, rye, and potatoes in his fields. Turnips, beets, cabbages, onions, pumpkins and peas filled the garden, with an herb garden as well, to grow Anna's food seasonings and "simples"herbs used as medicine. She and the daughters would have picked berries growing wild in the forest. Tobacco would also have been grown for smoking, which almost all of the Palatine men and women enjoyed. Maple sap and honey were used as sweeteners. Hops were used to brew beer, which in most homes was more popular than water. Tools were all homemade and crudemetal plows were not available, so Christian tilled the earth with a tree crotch shod with iron.  Leather hides for tools were cured in the farm tanning vat. Everything was stored in the barn, which had to hold enough autumn crops and salted meat to last through the long, brutal winters. In fact, the stone barns were usually better-constructed and more valuable than the log houses, for the simple reason that you could survive in a barn without a house, but not in a house with no barn to supply the necessities of life. As for furniture, there was plenty of woodmaple, cherry, and (of course) pinewhich was also needed to heat the house in the fireplace and stove. Times were obviously rough, but you can't help thinking how cozy the nights must have been with Anna Catharina cooking a late dinner, with the kids nestled around the fireplace and Christian smoking his pipe and telling stories of the Old Country. 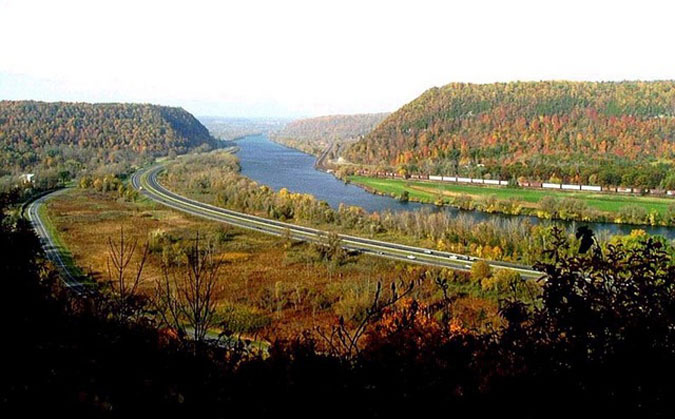 The Mohawk had now become the American Rhine, populated almost exclusively by Palatines, and the site of the first revolution against the British, albeit a smaller one than would occur 50 years later with George Washington and Thomas Jefferson. But it should be noted that while many Palatines protested their situation and the actions of Governor Hunter, they did not oppose the Queenafter all, the only other government in the area was French, and the Palatines remembered that nation as the one that burned their lands and butchered their neighbors back in Germany. There may have been military duty as well for Johann Christian Hauß or his son, as a "Jno. House" appears on a 1713 muster roll for Colonel Richard Ingoldesby's Company of Grenadiers, from October 25 to December 24th. Then in 1715, it was enacted That all persons of foreign birth professing Christianity could be naturalized by taking the oath of supremacy and subscribing the test and repeating the oath of abjuration. And Johann Christian Hauß, now free of indentured servitude, did just that with his friend, Heindrick Klock. (Sadly, the act was not to be construed to set at liberty any bondman or slave.) The religious qualifications were strictly enforced and Catholics were put under the ban. On the 11th of October, 1715, he was Naturalized as a citizen of the British Empire (as "Christian Houys" of Albany County). You may wonder why, after everything the British had done to Johann Christian Hauß, that he would have wanted to become a Naturalized citizen. The main reason was to protect the family land. England divided the people who dwelt within her borders into three classesnatural-born subjects, aliens, and denizens. But thanks to a British act passed in 1700, His Naturalized status enabled him to hold lands as well as transmit property to his children. This placed his children in the colonies on a par with subjects living in England itself. Of course, there was another reason, too: "Liberty." Mind you, Palatines of the Reformed Church defined "liberty" in a very different way than we do today. Freedom was a deeply personal matter. It meant that they could make decisions for themselves without Hunter or Livingston breathing down your neck, but with a willing and unbending obedience to the government protecting them. Although Johann Christian Hauß and his sons had deep disagreements with the British, they still became citizens under the Crown, in opposition to the French government that had pillaged and destroyed their homeland. After six years of traveling without a home or flag, then working as a virtual slave, he could now at least say he belonged somewhere, whether he liked the local government or not, and could finally get some Bürgerrecht. Johann Christian Hauß was finally a free man! Then in 1722, after many years of litigation, Gov. Hunter's successor, Gov. 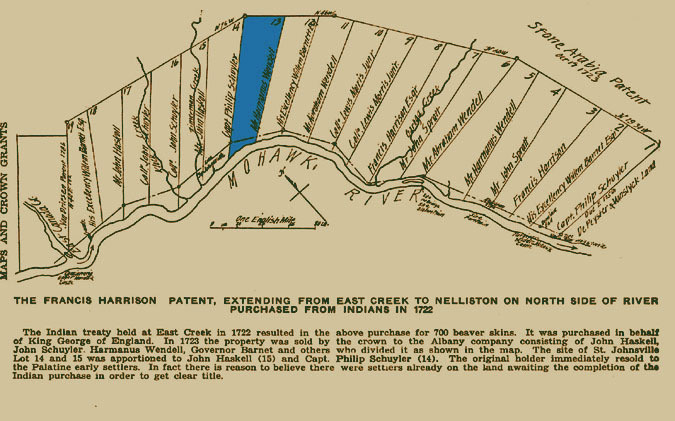 William Burnett, decided on a new strategy with the Palatines squatting in Scorie: He purchased new land in the Mohawk Valley for them to settle on legally. In 1723, 100 heads of families from the work camps were settled on 100 acres each in the Burnetsfield Patent midway in the Mohawk River Valley, just west of Little Falls. They were the first Europeans to be allowed to buy land that far west in the valley. He informed Britain that he would allow about sixty families that had been the strongest supporters of the crown to buy land at a decent price. Among them was the Hauß family. "In the year 1725 on August 26, we find in the Albany County records a transfer executed by Harmonas Wendell a parcel of land, being part of Harrison's Patent and lying near the mouth of Little Canada Creek, to Christian Haus and Hendrick Klock, Albany County deeds, Book 7, page 87, etc. The record of this transaction was taken from the St. Johnsville Reformed Church Book." ...But it wasn't to be. What The House Family of the Mohawk authors didn't know is that Harmanus Wendell died before the deed could be executed, and the property went instead to Harmanus' eldest son, Jacob Wendell, who didn't want to sell. The stress of it all must have been too much for Johann Christian Hauß. When the property finally changed hands, seven years later, he had either died or transferred the titled to Heinrich Walrath. His seemingly unending search for the promised land finally did endhe disappeared from the public record after failing to purchase the land, leaving his sons to fulfill his dream of Bürgerrecht. 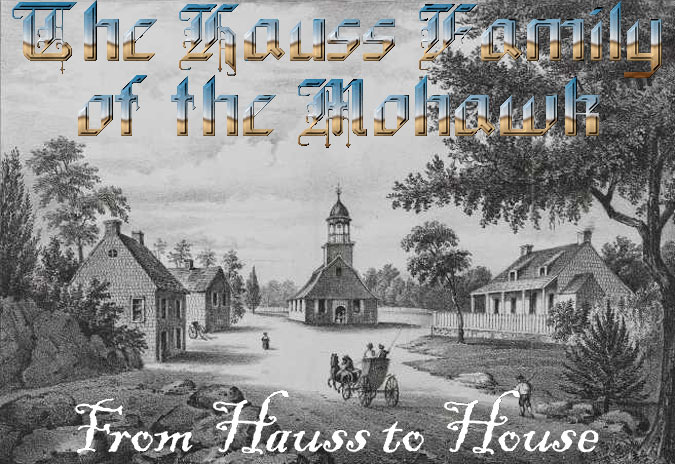 CHAPTER FOUR: HAUSS TO HOUSE: The family is Americanized, right along with the name. ¹It was in England that the spelling of the family surname would first be mangled, twisted, re-spelled, and forever changed. "Hauß" was simplified to "Haus" and then remolded into a variety of British spellings like "Hawes," "House," "Hays" and countless other variations. But since it's doubtful that Johann Christian Hauß or anyone in his family could spell, they never complained. ²According to ProGenealogists.com, out of the Mormon Family History Library in Utah, the earliest subsistence lists in the colonies, such as the ones used by Governor Hunter in New York, were taken directly from the passenger lists, and emigrants were listed in the same order. With this in mind the Hunter Subsistence Lists were used to compile reconstructed passenger lists. Since there were 847 individuals/families in these lists and 11 ships, that would mean there were about 77 of these names per ship. Some ships probably had more and some less, due to sicknesses and deaths on board. But a careful studying the Hunter lists leads to the idea that the names are listed roughly chronologically in the order of their arrival at New York. ³According to Property and Boundary Mapping in Colonial New York, by David Yehling Allen, Revised 10/23/10: "The most distinguishing feature of British maps of colonial New York is their preoccupation with land ownership... This focus on land ownership and partition reflects the growth of population under British rule, as well as the characteristically English desire of poor men to become independent farmers, and of rich men to become landed gentry. Land was also the primary source of wealth during the colonial period, and land speculation became a popular form of gambling in colonial New York, playing much the same role as the stock market does today." SOURCE INFORMATION: Old Court House, P. O. Box 1500, Fonda, NY 12068-1500 (518-853-8392). Dutch Houses in the Hudson Valley before 1776, by Helen Wilkinson Reynolds. Dover, 1965. 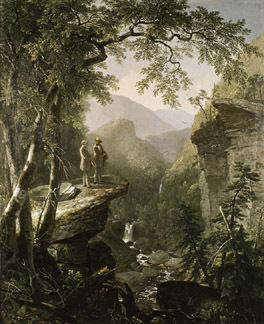 Trappers of New York; a biography of Nicholas Stoner and Nathaniel Foster, by Jeptha Root Simms. Albany: J. Munsell. 1850. Name: Johann Haus; Year: 1709. Place: England or America. Family Members: 3 children. Page: 272. Johann Adam Haus, Year: 1709. Place: New York (p. 255). This man is either listed as "Hoff" or "Hussmann" on the Hunter Subsistence Lists in 1710 and 1712. NOTE: In Palatine Families of New York, Hank Jones lists the last name as "Haas," and his family has a different point of origin than Johann Christian Hauß. While their last names look similar, they have totally different meanings in German. Haas is Dutch, German, and Jewish (Ashkenazic): from Middle Dutch, Middle High German hase, German Hase ‘hare’, hence a nickname for a swift runner or a timorous or confused person, but in some cases perhaps a habitational name from a house distinguished by the sign of a hare. As a Jewish name it can also be an ornamental name or one of names selected at random from vocabulary words by government officials when surnames became compulsory.